Do you feel like you missed the boat? Are you burnt out? Have your feet been dragging the sidewalk? Do you catch yourself dreaming of what could have been? Of if-only-I-had, or if-only-I-hadn't? This book is for anyone sitting in the audience who should be on stage, anyone reading blogs who should also be writing them, anyone supporting ministries who should be leading them. It's for the Christians who know there is a better life, but who are just stuck in the one they're living. Saved in the Jesus Movement of the seventies, Chris DuPré connected with countless Christians across the world. Yet too many of those Christians, Chris discovered, have years later lost the fire and stepped back from living out their faith. Why? Because they got stuck-stuck in rejection by others, stuck in fear of the unknown, stuck in loving a comfortable life, stuck in scores of similar ruts. What can set them free from their internal prisons? 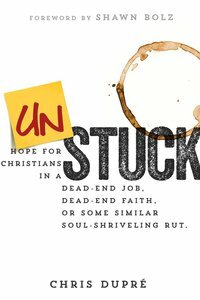 And what could Christians accomplish if we all just got unstuck? Shawn is an international speaker, pastor of Expression58 Church, producer, and author of The Throne Room Company, and Keys to Heaven's Economy, among others. He is well-known for his prophetic accuracy, and he is passionate about bringing God's presence and power into the entertainment industry and the local community. Shawn lives in Los Angeles, California, with his wife, Cherie, and their two beautiful daughters. Chris Dupre carries within his heart one great desire: that people would know the depths of God's great love for them. A pastor, teacher, author, worship leader, and spiritual father to many, Chris may best be known for his beautiful song, "Dance With Me." Chris and his wife Laura are parents of three lovely girls and four beautiful grandchildren and they reside in Franklin, Tennessee.